I rest my case. Dalmatians are clearly within the pointer family. Just need some DNA analysis to prove it conclusively. Braque du Bourbonnais with a tail. How long does she hold the point? Dalmatians actually will hold the point as long as an untrained pointer. Most normal dogs will exhibit the behavior in the form of a stalking behavior. Some people can train a dog that does this into a pointer. Foxhounds were sometimes trained to point in the eighteenth and nineteenth century. on May 11, 2011 at 12:51 pm M.R.S. My uncle used to hunt pheasants with his Dalmatian, many years ago. Some people thought that Blue was just an oddly marked pointer. Then there’s all those Pointing Labradors that are advertised. 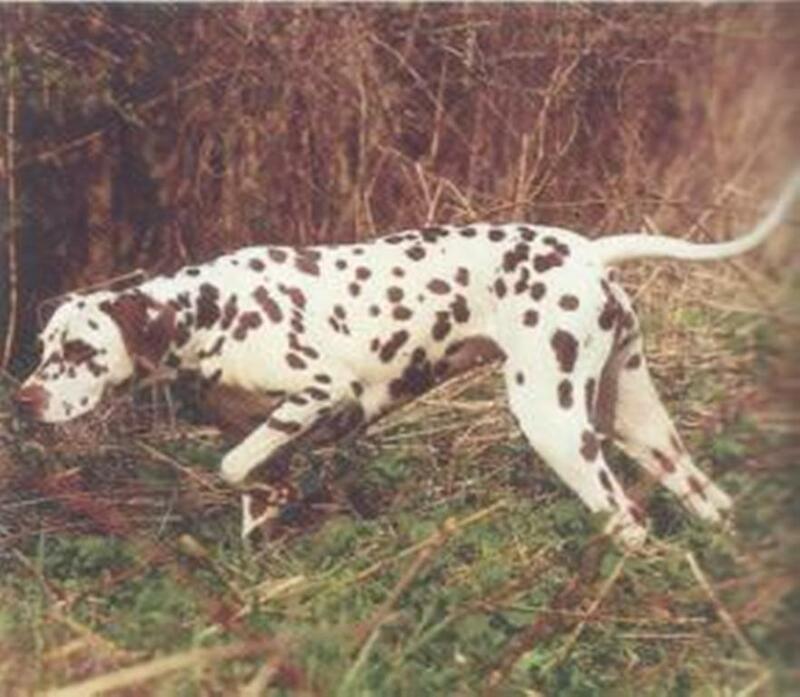 I had heard that in the last few decades, people were crossing in GSP and English Pointers into Dalmatian lines to combat their laundry list of health issues, particularly deafness but the national club was aghast and labeled the (often healthier) dogs as mongrels and effectively cancelled the project. Actually, it’s still going on. It’s just impossible to get the dogs recognized as Dalmatian, even though they have just a tiny amount of English pointer ancestry. on May 18, 2011 at 11:13 am M.R.S. “…It’s still going one” — What, the outcrossing?? NO. There was ONE breeding to a pointer back in the 1970s. And since the KC has registered some LUA Dals, it is very likely that their progeny will “come in the back door” with some British-registered dogs exported back to the USA. The AKC will not be able to deny dogs with 3 generations of UK registered ancestors. The project still continues, even though it was just a single outcross.